Standing in an open field behind Charlie Bob’s Restaurant on Dickerson Pike in Nashville as the sun began to set and temporary shop lights were being set up, Nashville’s women’s rugby team, the Stone Lions, prepared for a practice session. The team may not have the facilities like other Nashville area sports teams, but that isn’t a deterrent for its members. It isn’t the bright lights of a big stadium environment that drives them; it is simply a bond with their teammates and a desire to play the game. While many people in the South know rugby as only a game they occasionally see on a cable sports channel before continuing to channel surf, for those who have discovered the game it has become so much more. Unlike in most sports, social interaction with your competition off the field is one of the important aspects of the game. On the field, each team is trying to beat the other one back. As soon as the final whistle blows, however, each team exchanges pleasantries and moves on to “the social” where both teams get together for a friendly gathering. Nashville (yellow) and Knoxville (red) teams raise a player to fight for possession on a toss in. While the social aspect across team lines makes rugby different than most sports, the desire to win and compete at a high level is still the same. A rarity in traditional women’s sports, a big draw for women’s rugby is the ability to play a competitive full contact sport. Similar to American football, rugby is full of open-field tackling, but with one main exception – the players tackle without pads. Not only is rugby a sport that requires strength and fortitude, but the game requires exceptional fitness as well. The average player will cover four to five miles during the course of a game, so players need the endurance of distance runners. O’Neill also noted that women of many different backgrounds make up the Stone Lions. They have college students and stay-at-home moms on the team, along with nurses and business analysts, just to name a few. 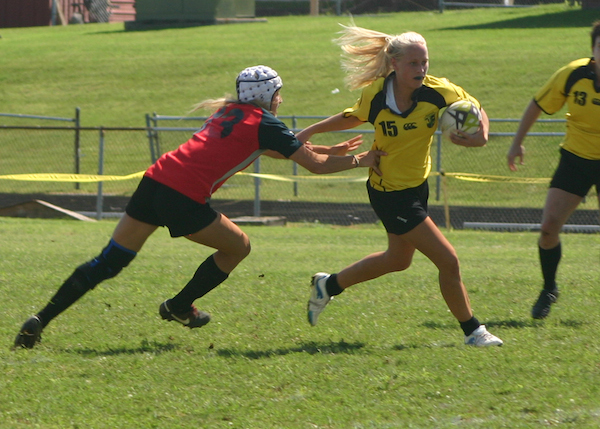 A Nashville Stone Lion gives a stiff arm as she breaks through a tackle attempt.  Regardless of the varying levels of experience in their teammates, when they all come together on the pitch, Nashville’s women’s rugby team is quite good. Playing like their team motto, “Hard as Stone. 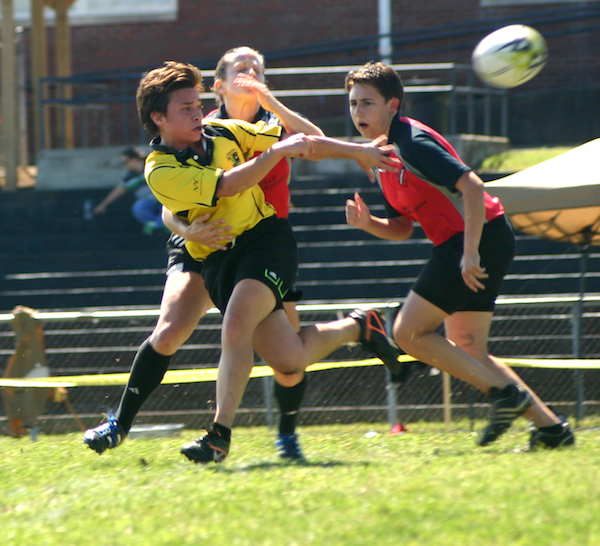 Tough as Lions,” Nashville opened its first match of the year with a dominating 67-0 shutout. In the home opener on the football field at Tennessee Preparatory School, the Stone Lions blanked a Knoxville squad, which used to be combined with the Nashville team years ago, 12-0. A Nashville Stone Lion pitches the ball before being tackled in Nashville’s home opening match. 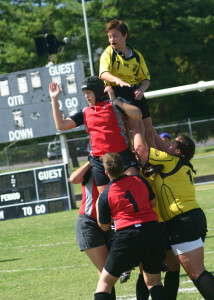 The Stone Lions play as part of the True South Rugby Union and are a member club of development with USA Rugby. They compete in a division made up of teams from Knoxville, Tenn., Memphis, Tenn. and New Orleans. At the end of the season, the divisional winners move on to a regional competition. Nashville would be pitted against teams from the Carolinas and Florida for a berth in the national tournament and a shot at a national championship. One major thing standing in the way for the Stone Lions’ continued success is having a place to practice and play games on a budget. Charlie Bob’s Restaurant has graciously provided a free field for the team to use for practices, since there is no rugby park in the middle Tennessee area. Otherwise, the organization would have to rent a football field for practice, which can be hard to come by in the fall. The club does have a few other sponsors, but it is largely self-funded by the players through fees and fundraising activities. Equipment and travel are the biggest expenses, with the teams in their division and region requiring overnight travel for away games. Despite playing a sport many in the area may not be familiar with, the Nashville Stone Lions will continue setting up temporary lights in a field behind Charlie Bob’s. As they compete for championships on the field, they will also continue showing people in town that rugby is not merely a game of hitting the other person as hard as possible, but rather it is a very safe game that involves great strategy and skill that brings people together, all the while having fun at the same time. 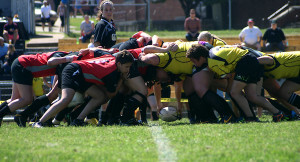 The Nashville Stone Lions (yellow) fight for possession in a scrum during their match against Knoxville. 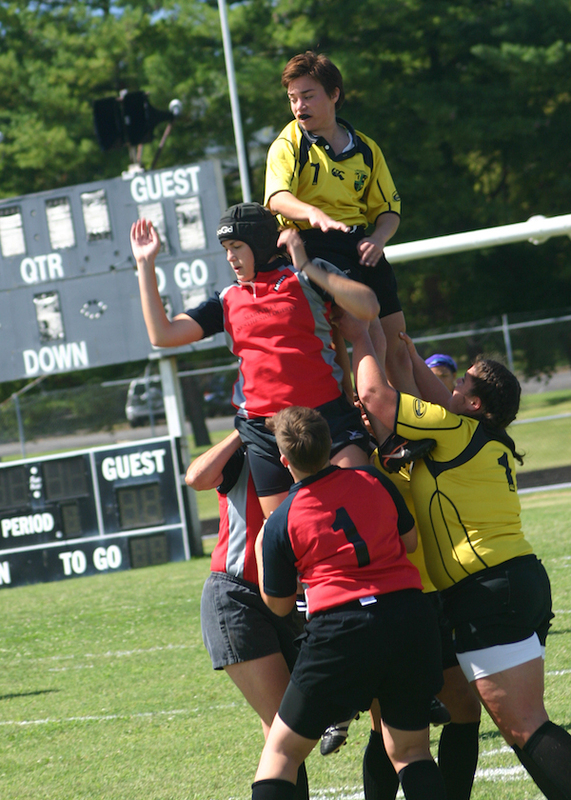 No Replies to "Nashville Women’s Rugby: Hard As Stone, Tough As Lions"